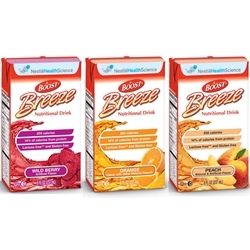 Resource® Breeze® is a delicious fruit-flavored, fat-free, clear liquid nutritional supplement for individuals who cannot consume a sufficient intake of food to meet their nutritional requirements. 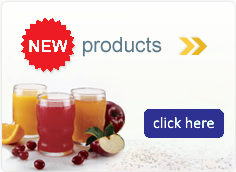 RESOURCE Breeze is a Medical Food -- consumers should consult with their physician on the use of this product. Peach: water, sugar, corn syrup, whey protein isolate (milk), phosphoric acid, citric acid, corn syrup solids, l-cysteine, natural and artificial flavor, ascorbic acid, yellow 6, zinc sulfate, alpha tocopheryl acetate, ferrous sulfate, niacinaide, red 40, calcium pantothenate, copper gluconate, manganese sulfate, thiamine hydrochloride, pyridoxine hydrochloride, vitamin A palmitate, riboflavin, folic acid, biotin, potassiujm iodide, phytonadione (vitamin K1), cholecalciferol (vitamin D3), cyanocobalamin (vitamin B12). Orange: water, sugar, corn syrup, whey protein isolate (milk), phosphoric acid, citric acid, corn syrup solids, natural flavor, l-cysteine, ascorbic acid, yellow 6, zinc sulfate, alpha tocopheryl acetate, ferrous sulfate, niacinamide, calciu, pantothenate, copper gluconate, manganese sulfate, thiamine hydrochloride, pyridoxine hydrochloride, vitamin A palmitate, riboflavin, folic acid, bioton, potassium iodide, phytonadione (vitamin K1), cholecalciferol (vitamin D3), cyanocobalamin (vitamin B12).